SAN FRANCISCO — Sandra Yamileth Lopez works at one of San Francisco’s most celebrated bakeries, Tartine. She fled horrific violence in Honduras and applied for asylum in California. She can work legally but, as for many new immigrants, it will be years before she becomes eligible for Medicaid or federal health insurance subsidies. In the meantime, she enrolled in Healthy San Francisco, a pioneering program that guarantees health care to any uninsured city resident. Lopez can live her life again, she said. Healthy San Francisco launched in 2007, under then-Mayor Gavin Newsom, years before the Affordable Care Act and at a time when universal coverage was an audacious — and radically liberal — goal. Partially funded through employer fees, Healthy San Francisco is a reorganization of the city’s public health system. Patients were directed away from expensive and overburdened emergency rooms and into primary care clinics. They can get visits to specialists, prescription drugs and, perhaps most important, protection from massive bills should they need emergency care. Although it may seem simple and obvious now, said Dr. Alice Chen, chief medical officer and deputy director for the San Francisco Health Network, turning a public safety net that rescued people in crisis into a proactive, coordinated system was a revelation. “We took the existing organizations that provided care, made it into a system, and then actually created an interface for patients who were uninsured and reached out to them and said, ‘Come on in, come in and use the system of care,’” Chen said. After the major provisions of Obamacare went into effect in 2014, most Healthy San Francisco patients enrolled in Medicaid or bought subsidized private plans. But about 13,000 remain: those who earn too much for public programs but still can’t afford private insurance, and people like Juan, who are undocumented and barred from federal public assistance. Juan, who asked us to use only his first name, has been recovering from a heart attack under the watchful eye of a cardiologist. He takes a number of prescription drugs that he otherwise could not afford. But here’s the dilemma: He’s covered only inside the city limits of San Francisco — it’s not portable health insurance. Juan, who works in a local warehouse, wants to move to San Diego to care for his aging mother, but then he’ll be out of the program and unable to afford his medications. About 3 million Californians remain uninsured. About half of those lack legal status like Juan, and the rest cannot afford the sky-high cost of American health care. Fury over those costs, even for those with insurance, has energized Democrats who want the U.S. to have universal health coverage, like all other industrialized nations. But there are many variations: single-payer, “Medicare-for-all,” plans that would largely do away with insurance companies or employer-based coverage, and others that would simply regulate them more closely. Now that the former mayor of San Francisco has become governor, Newsom said he wants to make California a testing ground for universal coverage. Newsom has asked the Trump administration to allow California to pursue a single-payer system. Since that’s unlikely to happen, he’s pursuing other options by creating what he says is the nation’s largest prescription-drug purchasing pool to negotiate drug prices, restoring the individual health insurance mandate, allowing undocumented young adults up to age 26 into Medicaid and giving state subsidies to 250,000 more middle-income Californians. And that’s happening across the nation. In Washington, Democratic Gov. Jay Inslee has proposed a low-cost public health plan to compete with private insurers on the state insurance exchange. In New Mexico, Democrats are sorting out how people without insurance could buy in to Medicaid. And in New York City, Mayor Bill De Blasio is promising health care to undocumented immigrants and those who can’t afford insurance. “There’s enough people in this city who don’t have any health care coverage to fill the entire city of Milwaukee, or the entire city of Baltimore. That’s just a vast number of people,” he said. It’s a total of some 600,000 New Yorkers. De Blasio recruited Dr. Mitch Katz, the public health mastermind behind Healthy San Francisco, to build a similar program in the city’s five boroughs. City officials plan to pump more than $100 million a year into the city’s financially strained public hospitals and clinics and actively enroll the uninsured into a program called NYC Care. That includes struggling young people, like freelance musician and composer Andrew Sharkey, who has gone untreated for Crohn’s, a serious bowel disease. He dropped his coverage in 2015. “I just didn’t know where the money was going to come from. I was working two jobs. They were both part-time so that they didn’t have to pay into my insurance,” said Sharkey. Under de Blasio’s plan, Sharkey would have a regular primary care doctor and treatment from specialists and access to prescription drugs. Word about NYC Care is already spreading among the more than 300,000 undocumented immigrants in the city, like Antonio, who asked us to use only his first name. He thinks de Blasio’s plan would simplify his life, allowing him to focus more on his health and work, and less on the endless paperwork that comes with being uninsured. Americans already pay for undocumented immigrants when they come to the emergency room, said Mayor de Blasio. Universal health care polls well with American voters, but the Trump administration said if it became a national policy, it would consume the federal budget. And some Democrats are voicing warnings of their own. Former Vermont Gov. Peter Shumlin was forced to abandon his attempt to bring single-payer to Vermont. “PBS NewsHour” producers Jason Kane and Kira Wakeam contributed to this report. 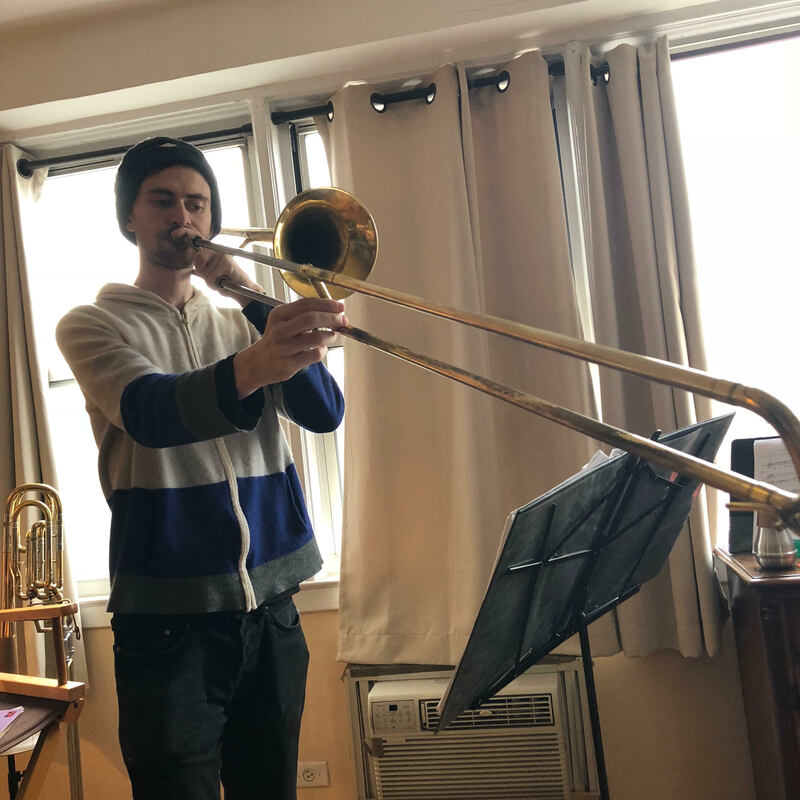 Andrew Sharkey, a freelance musician in New York City, dropped his insurance coverage in 2015, despite having Crohn’s disease.